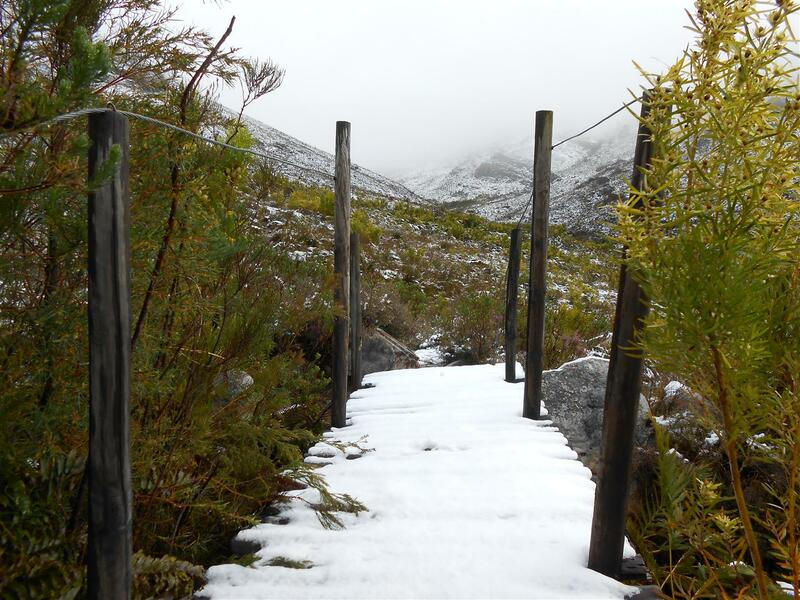 Last winter we spent a magical day in freshly fallen snow on the Perdekop hiking trail in the Mont Rochelle Nature Reserve outside Franschhoek. 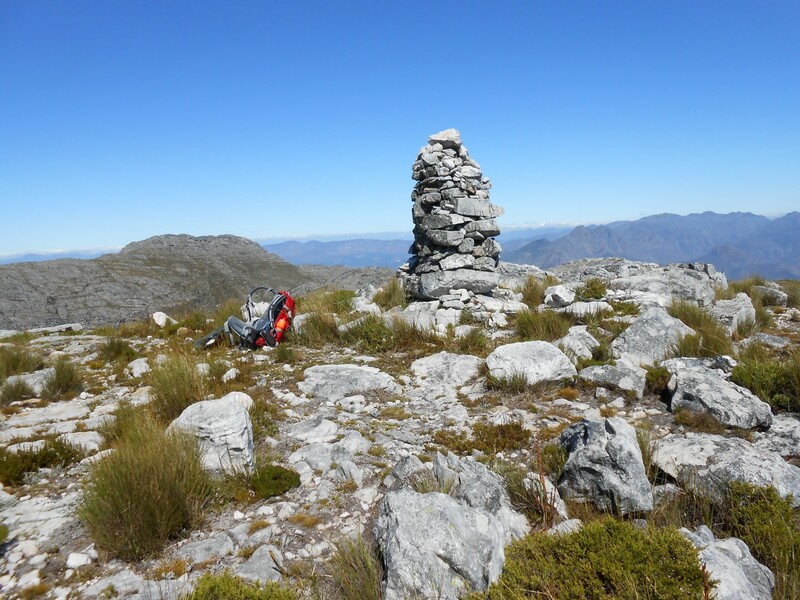 Due to the thick blanket of snow and poor visibility we didn’t make it to the summit of Perdekop on that day, so on a Saturday in March we headed to Franschhoek again to go and see what we missed. And what a stunning autumn day we had: clear blue skies, not too cool and not too hot, no wind – perfect. The hike starts out in the rude way that most mountain hikes seem to do: steep. 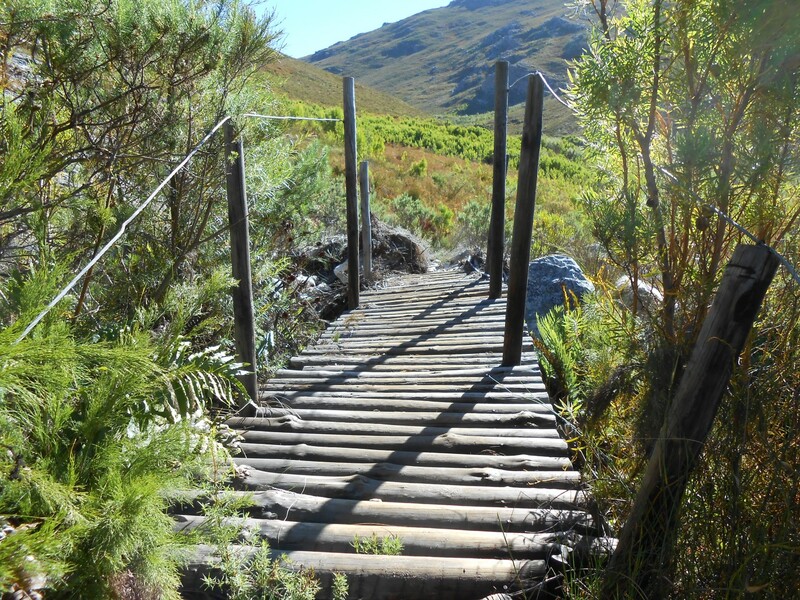 The path zig-zags steeply for about 15 calf-cramping minutes, especially on legs that have been sitting in a car for 1,5 hours from Cape Town. But soon the gradient becomes more humane and you start to hear birds and insects above your asthmatic wheezing. It was interesting to see landmarks from our winter hike minus the snow. The path follows the left hand bank of the Du Toits River for about an hour, climbing all the way (the total ascent is 850m, so not much level ground here) until one crosses the river and starts going around the top of an amphitheatre. 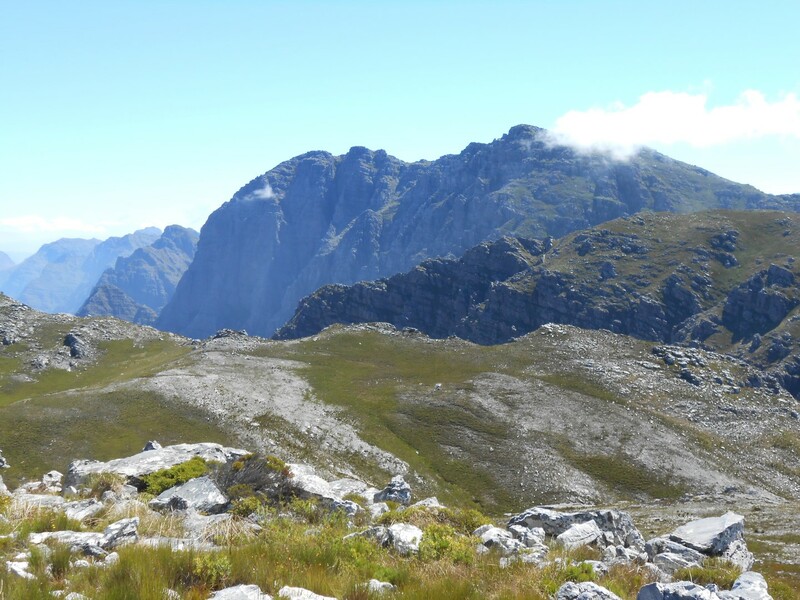 The scenery is spectacular: towering cliffs, deep dark valleys, undulating hills and endless sky. 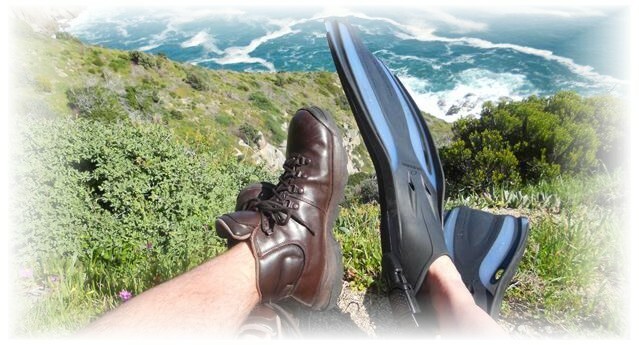 At various points one can see the town of Franschhoek as well as the Theewaterskloof, Berg River and Wemmershoek dams. (From Perdekop itself the Stettynskloof Dam can also be seen). 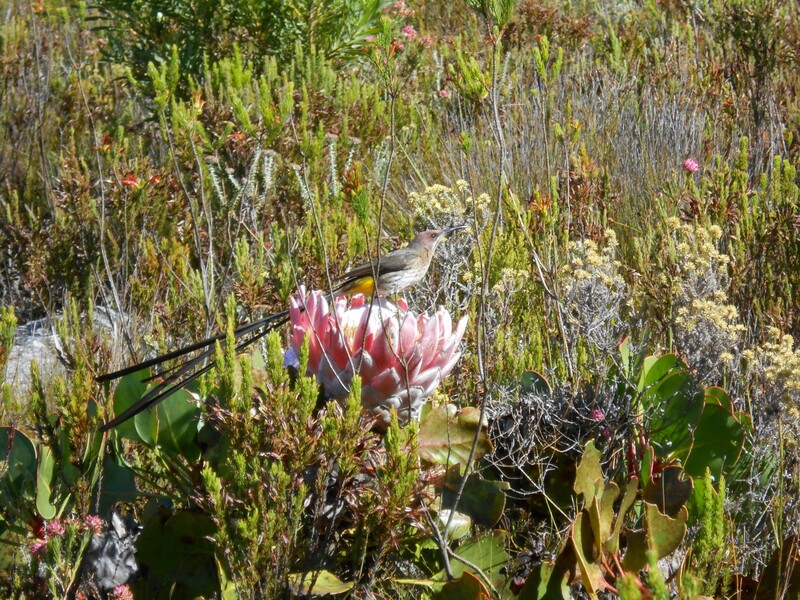 The scenery near the top of the hike varies with every step, from rocky lunar landscape to wildflower meadow to lush wetland. We looked around us and had ever-changing opinions regarding which hill was the actual Perdekop. (The name translates to Horse’s Head, but that wasn’t very helpful). Eventually we were heading up quite a steep slope towards what I felt sure must be our summit – only to be told by our map that we still had about 600m distance and 150m climbing to go! It was then that we finally spotted the smallish dome that was our destination: Perdekop, the highest point in the reserve at 1,575m. After about 3 hours of hiking we made it to the top of the horse’s head. There is a very large stone cairn to mark it, just in case you still doubt that you are on the right summit. We arrived just behind two trail runners who had taken the ‘down’ route up, but they didn’t hang around and we soon had the peaceful and endless vistas to ourselves. What a beautiful spot! After a half hour lunch stop we packed away our impromptu picnic, took the obligatory summit photo and headed back down. 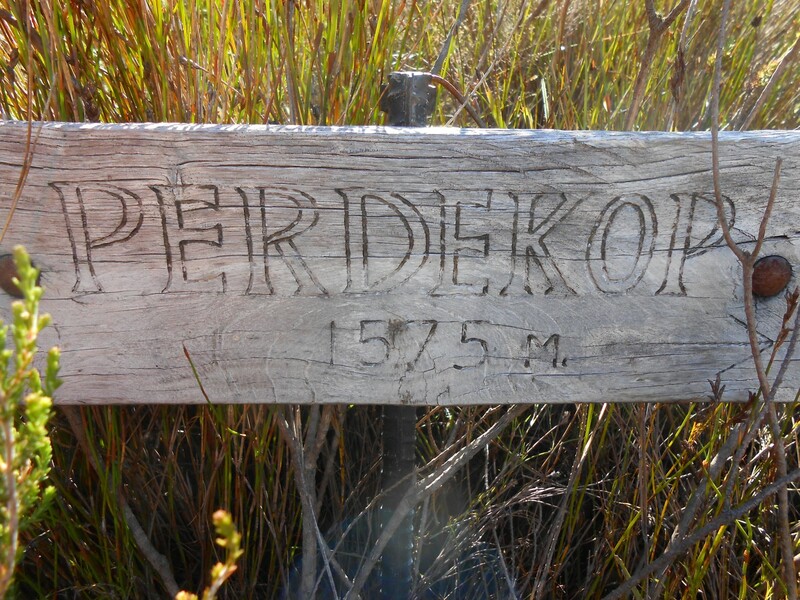 The Perdekop trail is circular and can be done in either direction. Since we had done much of the ascent route before on our snow hike we knew what to expect, but the route that we took down was new to us. Once again the scenery was ever-changing. 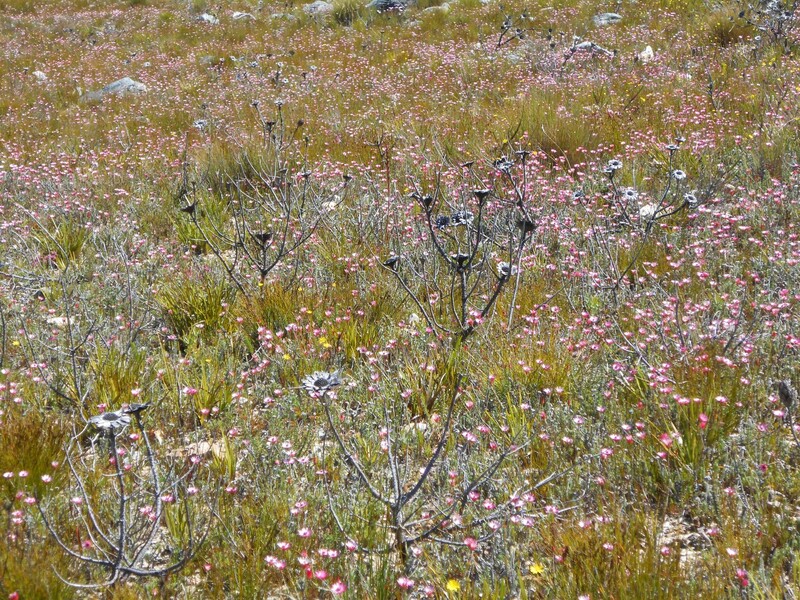 I couldn’t get enough of the fields and fields of dainty yellow daisies and pink everlastings against the deep green backdrop. Photos just cannot do it justice. 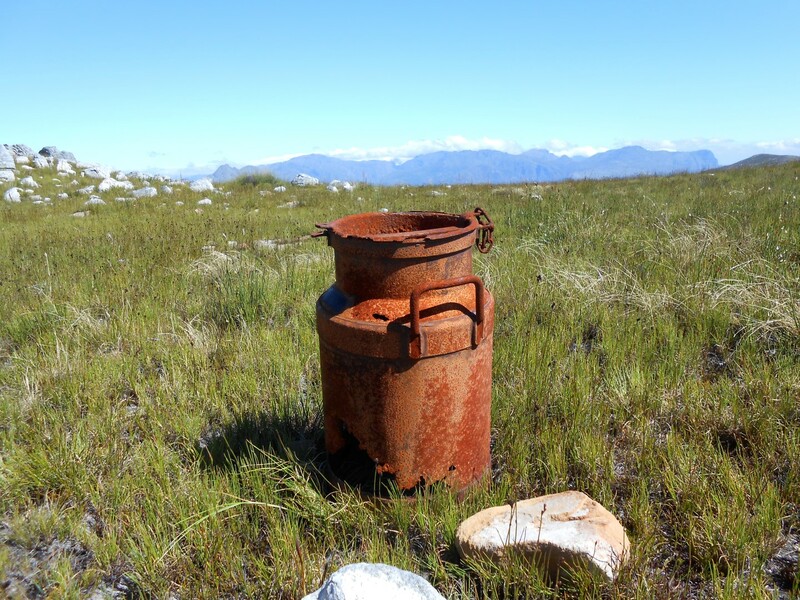 We even came across an old milk can, rusting away in the middle of nowhere. How would that have ended up 600m above the nearest farm? Unfortunately for me the gradient soon became steeper and steeper. The song in my heart came to an end as my knees started to protest and my mind started doing incline ratios and not liking the answer. I’ll go uphill all day, but you may notice that downhills are not for me. Just when you think the end is in sight the trail leaves the worst for last with a ridiculous but mercifully short descent right down to the river, and from there it’s across a wooden bridge and then quite steeply uphill (yay for me) for a few hundred metres back to the start of the trail. What a great outing. 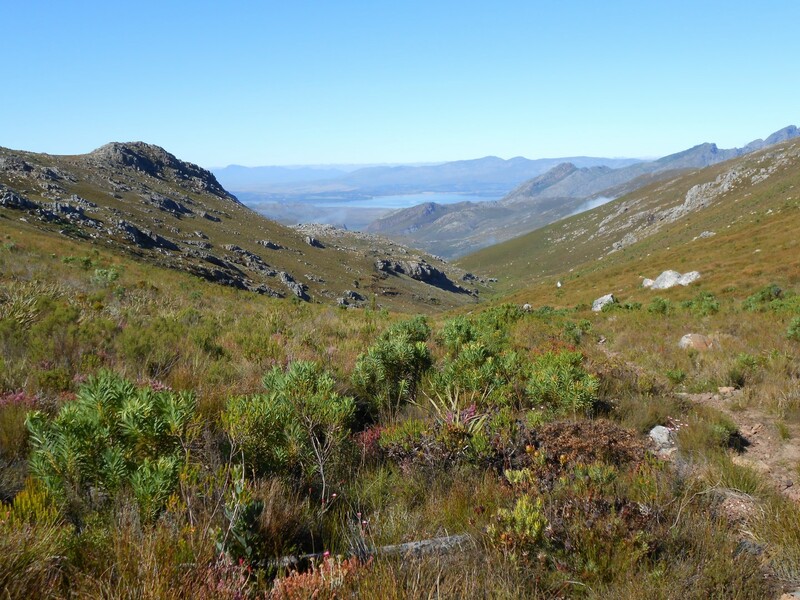 The Mont Rochelle Nature Reserve has several other trails on offer for hikers of varying abilities, and I have no doubt we’ll be back soon to explore some more. See you in the mountains!